Background: Despite its key role in the treatment, major abdominal surgery has been indicated as a cause of a metabolic, neuroendocrine and immunological response. Several studies have demonstrated that the magnitude of this postoperative Systemic Inflammatory Response (SIR) is directly associated with the development of complications after colorectal surgery. Objective: The aim of the present study was to investigate the association between preoperative administration of corticosteroids and overall survival, disease free survival rates and anastomotic leakage in colorectal cancer patients treated with surgery. 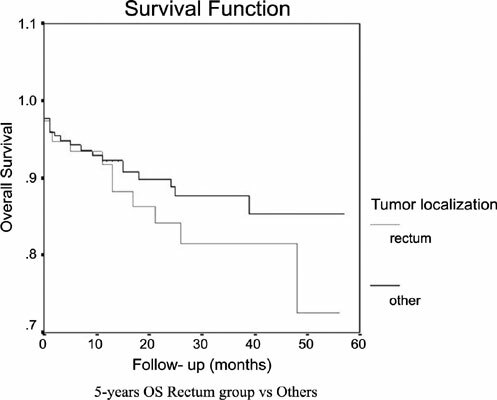 Methods: A retrospective review of prospectively collected data was performed of 354 patients with colorectal cancer who had undergone curative resection between June 2012 and December 2016, at the Surgical Oncology Unit, University Hospital of Messina. Results: A total of 249 patients matched the inclusion criteria and were included in this study. A total of 159 patients in stages I and II with negative lymph vascular invasion were included in the ‘N- group’ while 90 patients from stage III with positive lymph vascular invasion were included in ‘N+ group’. The OS and DFS in N+ group showed a better 5-years OS (88,46% vs. 81,25%) and DFS (73% vs. 78,1%) rates for patients who have been given preoperative corticosteroids, but the Log-Rank test did not reach statistical significance. Also in the N- group, the Kaplan-Meier curves showed better 5-years OS (97% vs. 87,4%) and DFS (91,4% vs. 88,7%) rates for patients who have been given preoperative corticosteroids, but the Log-Rank test did not reach statistical significance. Moreover, the preoperative administration of corticosteroids did not modify the frequency of anastomotic leakage. Conclusion: This study has demonstrated that preoperative corticosteroids administration improves outcomes following colorectal surgery probably as a result of attenuating the SIR. Our results thus do not support avoiding low-dose preoperative corticosteroids in colorectal surgery. Nevertheless, further work is warranted to validate the influence of preoperative corticosteroids in colorectal surgery. Pre-operative corticosteroids, colorectal surgery, oncological outcomes, neuroendocrine, anastomotic leakage, cancer.